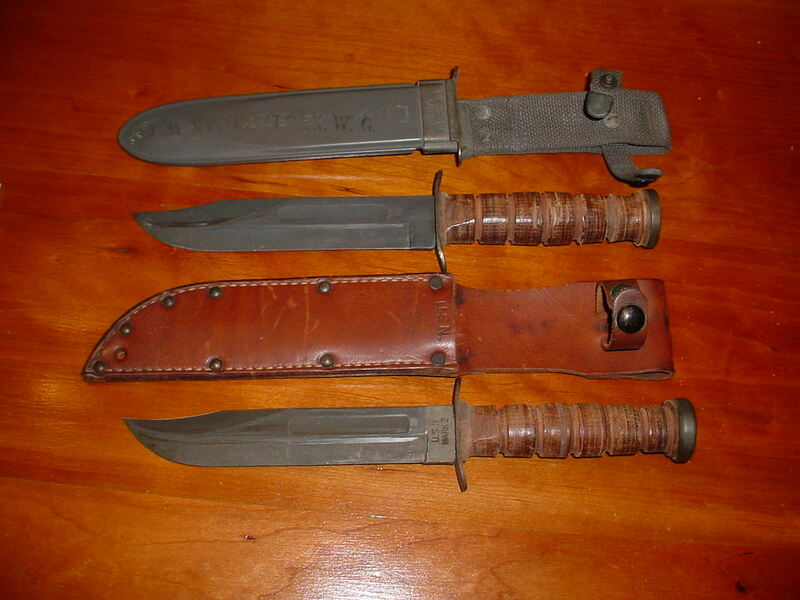 Ka-Bar (trademarked as KA-BAR, capitalized) is the contemporary popular name for the combat knife first adopted by the United States Marine Corps in November 1942 as the 1219C2 combat knife (later designated the USMC Mark 2 combat knife or Knife, Fighting Utility), and subsequently adopted by the United States Navy as the U.S. Navy utility knife, Mark 2. 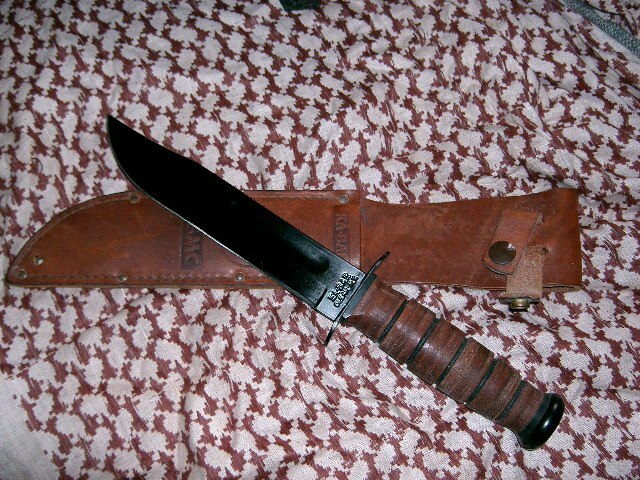 Additionally, KA-BAR is the trademark and namesake of a related knife manufacturing company, KA-BAR Cutlery Co., Inc. (formerly Union Cutlery Co.) of Olean, New York, a subsidiary of the Cutco Corporation. Although KA-BAR Cutlery, Inc. currently makes a wide variety of knives and cutlery, it is best known for the KA-BAR fighting utility knife, which has traditionally used a 7 in. (178 mm) 1095 carbon steel clip point blade and leather-washer handle. Other, more modern versions of this knife feature single or dual-edge blades and synthetic handles made of Kraton (a non-slip rubber substitute). 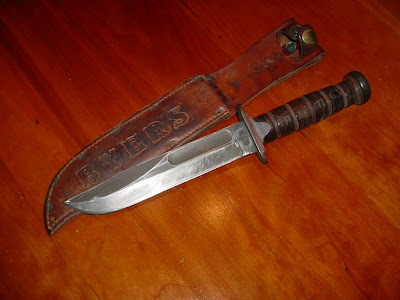 The owner of the KA-BAR trademark, the Union Cutlery Co. of Olean, New York, began using the name on its knives and in its advertising in 1923 after receiving a testimonial letter by a fur trapper, who used the knife to kill a wounded bear that attacked him after his rifle jammed. According to company records, the letter was only partially legible, with "ka bar" readable as fragments of the phrase "kill a bear". In 1923, the company adopted the name KA-BAR from the "bear story" as their trademark. Beginning in 1923, the KA-BAR trademark was used as a ricasso stamp by Union Cutlery Co. on its line of automatic switchblade pocket knives, including the KA-BAR Grizzly, KA-BAR Baby Grizzly, and KA-BAR Model 6110 Lever Release knives. 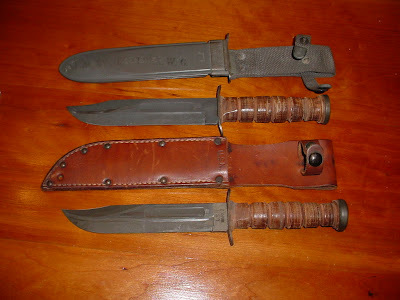 After the United States' entry into World War II, complaints arose from Army soldiers and Marines issued World War I-era bronze or alloy-handled trench knives such as the U.S. Mark I trench knife for use in hand-to-hand fighting. The Mark I was relatively expensive and time-consuming to manufacture, and reports from the field indicated that the knife's large 'brass-knuckle' fingerguard handle made it difficult to secure in conventional scabbards while limiting the range of useful fighting grip positions.Another criticism was that the Mark I's relatively thin blade was prone to breakage when used for common utility tasks such as cutting wire, opening ammunition crates and ration tins.A final impetus came from the War Department, which had determined the need for a new multipurpose knife capable of fulfilling the roles of both a fighting and a utility knife, while at the same time conserving strategic metal resources. The Marine Corps authorized limited issuance of a fighting knife with a stiletto blade design, the Marine Raider Stiletto designed by Lt. Col. Clifford H. Shuey, a Marine Corps engineering officer. Shuey's pattern was essentially a copy of the Fairbairn–Sykes fighting knife with altered material specifications designed to reduce dependence on critical strategic metals. The Raider stiletto was initially issued to elite Marine forces, including the entire 1st Marine Raider Battalion commanded by Colonel Merritt A. Edson, the USMC 1st Parachute Battalion, and to Marines of the 2nd Marine Raider Battalion commanded by Lt. Col. Evans F. Carlson.Primarily intended as a thrusting (stabbing) weapon, the Marines of the 1st Raider battalion found the Raider stiletto to be well designed for silent killing, but was of little use for any other purpose, and too frail for general utility tasks.After their first combat, many Marines in the 2nd Raider Battalion exchanged their Raider stilettos for No. 17 and No. 18 Collins general-purpose short machetes (machetes pequeños) purchased with unit funds. 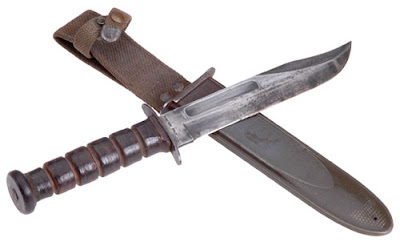 The Collins machetes, which superficially resembled a large Bowie knife, were also issued to some Army air crews as part of the Jungle Emergency Sustenance Kit of 1939. 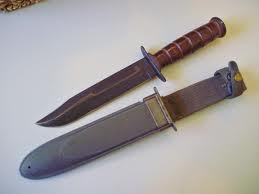 KA-BAR makes Army and Navy versions as well as USMC versions.They are the same as the Marine version except for different initials at the bottom of the blade and different symbols on the sheath. Marines today often give the blades, guards and pommels of their knives a few coats of non-reflective matte black spray paint to reduce reflected light and give them a little more protection against saltwater corrosion.Its moderate carbon and low chromium steel mixture allows the blade to hold an edge very well. The 1095 chrome-vanadium steel used in the blades of contemporary KA-BARs has a hardness of 56–58 HRC, while the guard and pommel are made from sintered 1095 carbon steel. Besides use as a fighting knife, the Mark 2 has proven its usefulness as a utility knife, used for opening cans, digging trenches, and cutting wood, roots, wire, and cable.In 1995, the design was updated with a tool steel blade, synthetic handle, and synthetic sheath marketed as "The Next Generation".As of June 2012 the "Next Generation" models have been discontinued.